Speed:Sport:Life’s RacerBoy-Rob Krider is doing live commentary at NASA’s 25 Hours of Thunderhill this weekend. In the photo above he is interviewing Chris Puskar of Carbotech Brakes. The production crew got some great footage and driver interviews as well as coverage with Bruvado, I/O Port Racing Supplies, Sampson Racing Communications, and Hoosier Tire West. Check out the coverage on GoRacingTV.com. 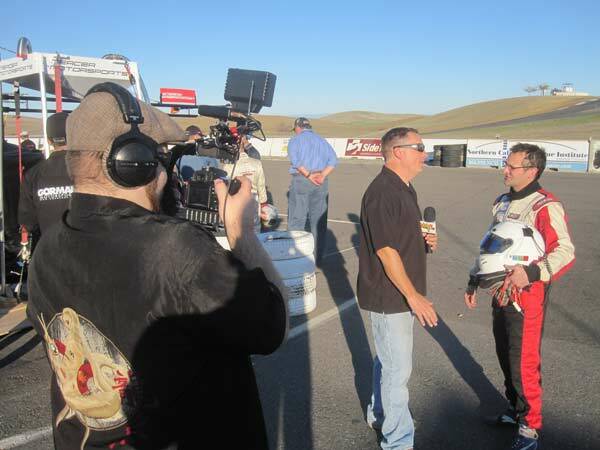 GoRacingTV.com sent its camera crew to Buttonwillow Raceway to cover the ChumpCar Summer Sunset 14-hour enduro. The race began at 9:00 a.m. continued through the sunset and into the darkness until 11:00 p.m. when the checker fell after fourteen grueling hours of racing in the summer heat. No this is not an HD screen capture from a recent episode of Top Gear. This Forza Motorsport 4 and it has the Top Gear test track in it. You can be the Stig. Sounds good? Well, it also has one of the coolest features in racing game history… a rewind button. If you make a mistake, don’t sweat it. You don’t need to restart a thirty minute race, you can just REWIND back a corner or two before you went way too hot and missed a corner (wish I could add that feature to my real race car). Click the link below to check out more on the game and see how we built a trick little driving simulator out of random garage parts. Back in the day, Ford took their RoboCop starring, grocery getting, soccer player hauling, workhorse vehicle with a terrible name (Taurus) and somehow actually made it cool. It was called the SHO and that acronym stood or Super High Output. The SHO was fast and it even handled quite well. In 2011, Ford brought the SHO brand back. Would this car be just a “badge” glued on the trunk lid to try and score props from the successes of yesteryear or would the new SHO actually bring the juice? Check out how this all-wheel drive twin-turbo-charged asphalt chewer handled the Racer Boy Review Categories and find out. NASCAR has Daytona, endurance racers have Le Mans, crap-can racers have ChumpCar, and kids who race soap box have the All-American Soap Box Derby World Championships in Akron, Ohio. For a kid involved in gravity racing there is no bigger achievement than the three lane “show” at Derby Downs. This year Krider Racing and Speed:Sport:Life went to the big race to check it out. Never Ever Be Late To The Soccer Game. ChumpCar Results. You are seeing the image correctly. That is a Plymouth Voyager road racing! The van, run hard by “The Soccer Moms” race team, traveled from Oregon down to Buttonwillow Raceway in Southern California to run in the 14-hour “Summer Sunset” ChumpCar endurance race. The van did quite well getting the kids to practice and put down some pretty fast laps. Hit the jump below to see how it faired overall in the ChumpCar race. Photo by VanHap Photography.